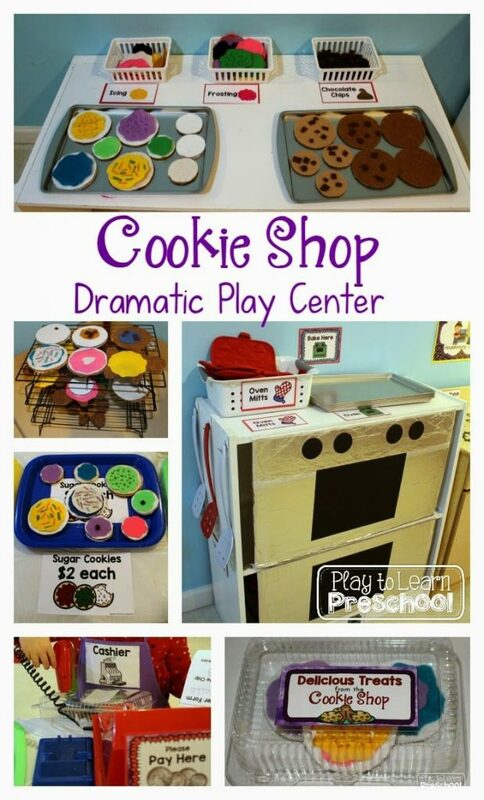 If you’re a regular reader of this blog, you already know how much we love our dramatic play center, right? Well, we’re trying a new theme this month and I am over-the-moon excited to share it with you. 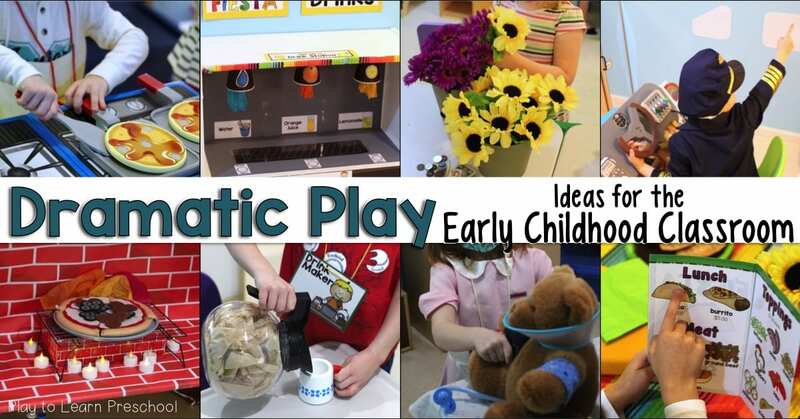 It is one of those centers that is so fun and complex that the students play with it for our entire center time (almost an hour and a half!). 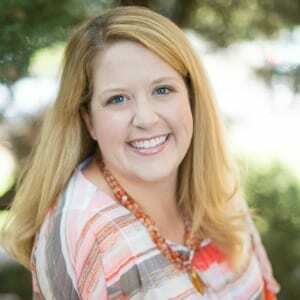 In fact, it’s so much fun that I’ve had neighborhood kids (all the way to 6th grade) ringing my doorbell this week asking to come play at preschool because they’ve heard that I have something fun set up. How great is that?! Here’s a view of the front counter. 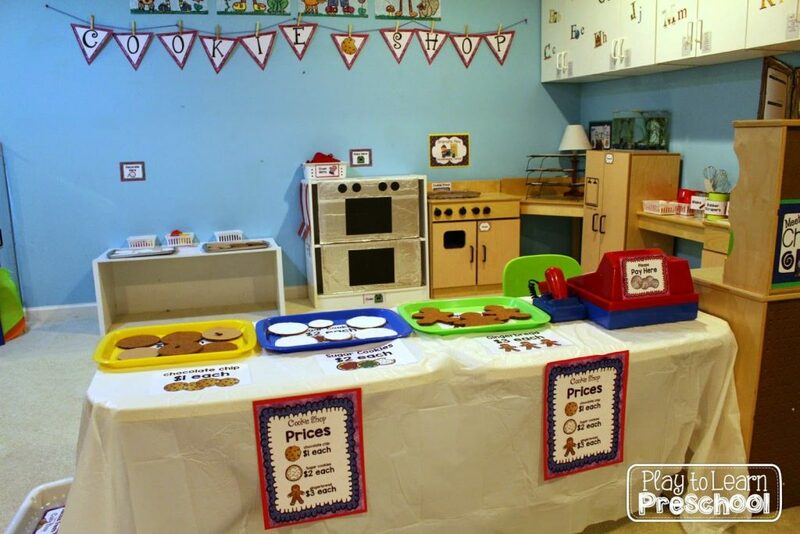 Our “Cookie Shop” sells 3 types of cookies – Chocolate Chip, Sugar and Gingerbread. 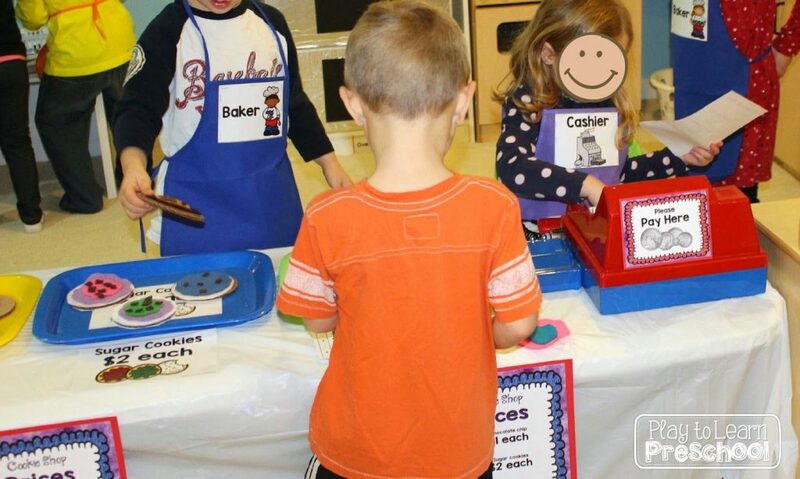 We (the teachers, ahead of time) made the cookies out of felt and glued them to cardboard for durability. All of the employees wear an apron with their job assignment on it. I ordered these aprons online in a pack of 12. Then we just stapled the job titles right to them! Behind the counter, we have mixers and ingredients for making the dough. 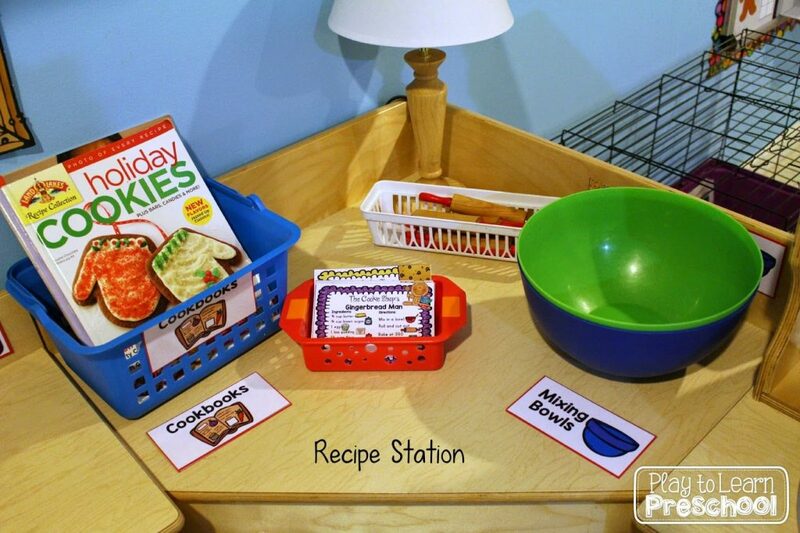 We added a basket full of cookie cookbooks and a pile of recipe cards (with clear, easy picture directions) so that our little bakers can measure and mix everything correctly! 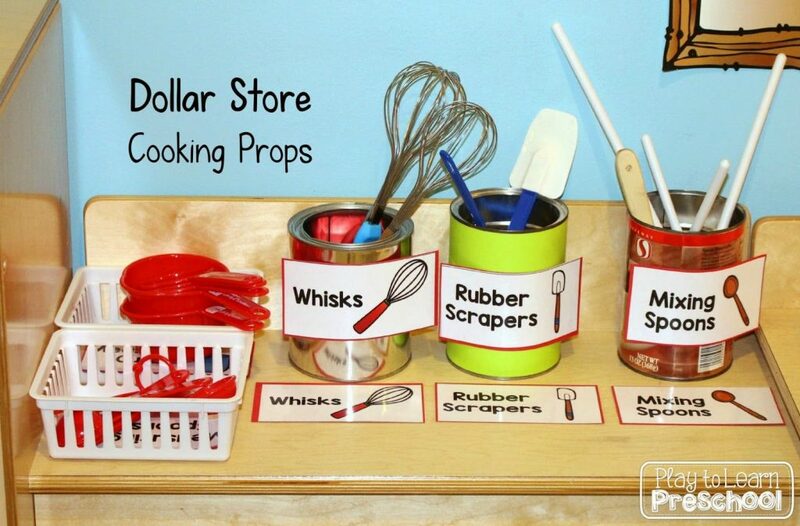 I hit the Dollar Store for a slew of baking props– measuring cups, measuring spoons, whisks, rubber scrapers (4 for $1! ), mixing spoons, oven mitts, spatulas, cookie trays and digital timers. In my experience, the key to keeping everything organized is to have 2 labels– 1 on the supply, and 1 on its put-away spot. 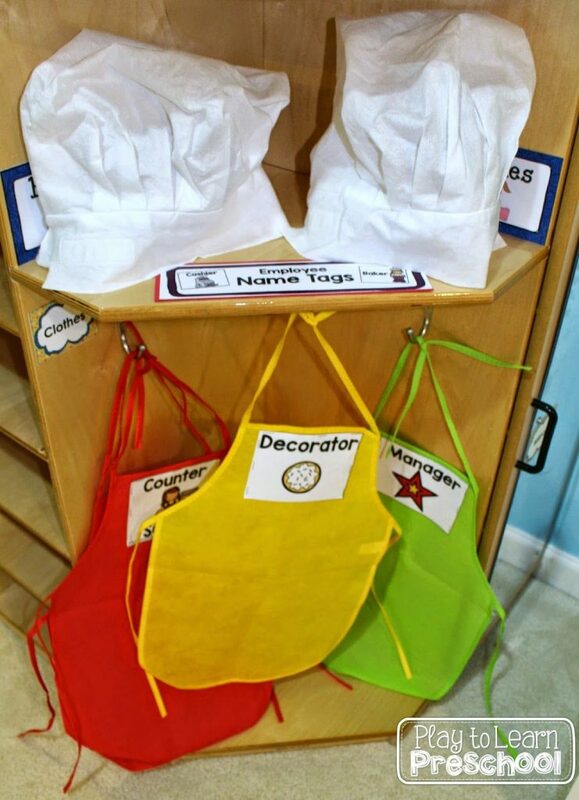 Each dramatic play area that we set up has to have some type of a “centerpiece” — something that makes it look very different from the regular housekeeping center. At the dinosaur dig site, it was the plaster tub of fossils. At our hospital, it’s the cot for the triage room. At the restaurant, it’s the hostess station with menus. Here at the Cookie Shop, it’s the big double oven! 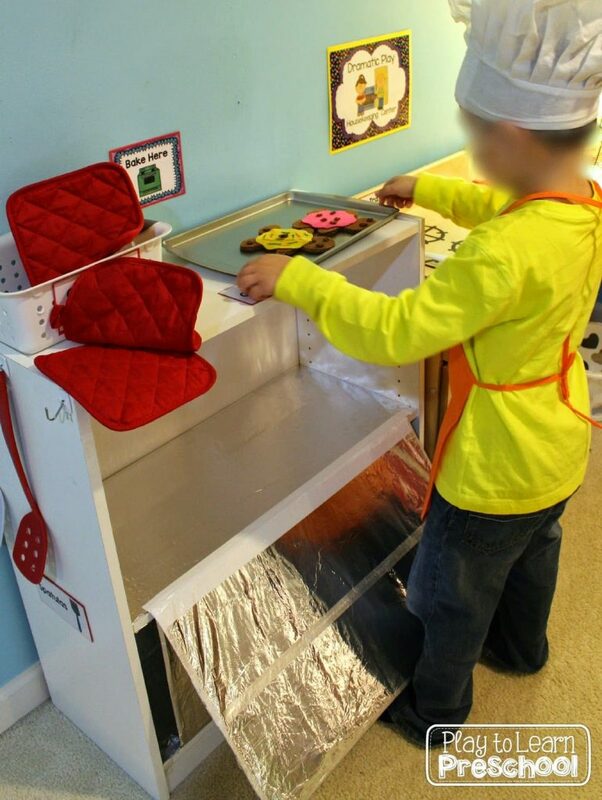 The doors open so that our little bakers can slide their trays of cookies right inside. Super-Gemma made the oven from the cheap white bookshelf that we use for everything. 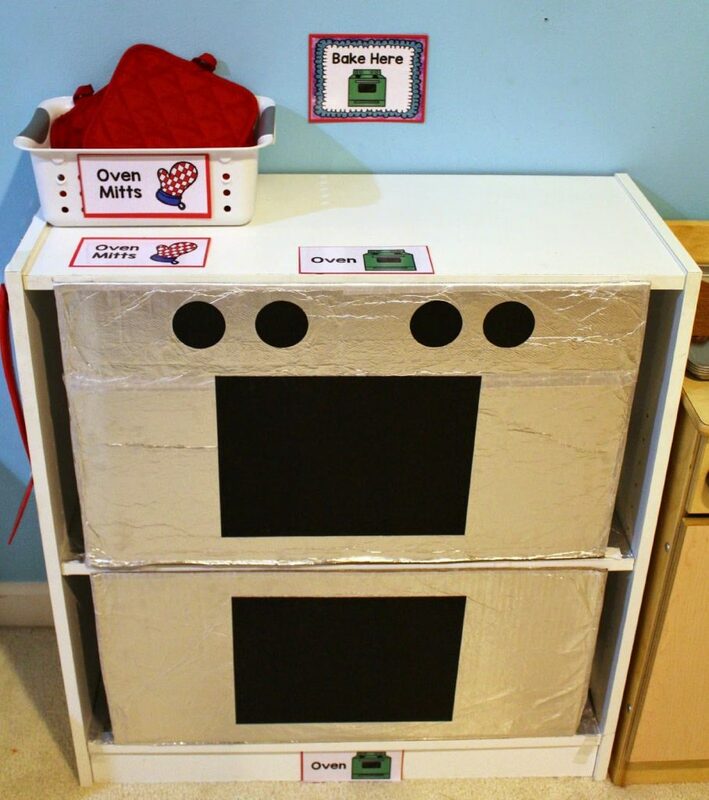 She cut 2 pieces of cardboard from a big box, covered them in aluminum foil and glued black construction paper on the front to make windows and knobs. The doors latch with a tiny piece of velcro on the shelf. Genius! 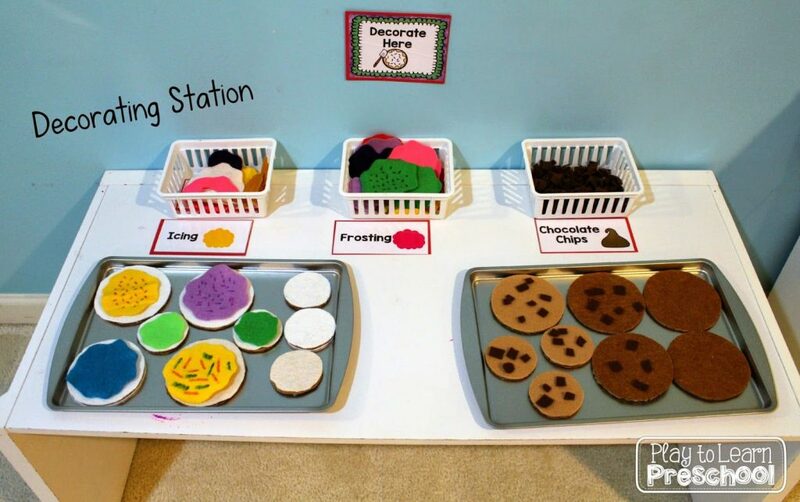 When the cookies come out of the oven, it is time to take them to the decorating station where the decorators can add felt icing and brown felt chocolate chips. Then they move the cookies to the front counter for display. 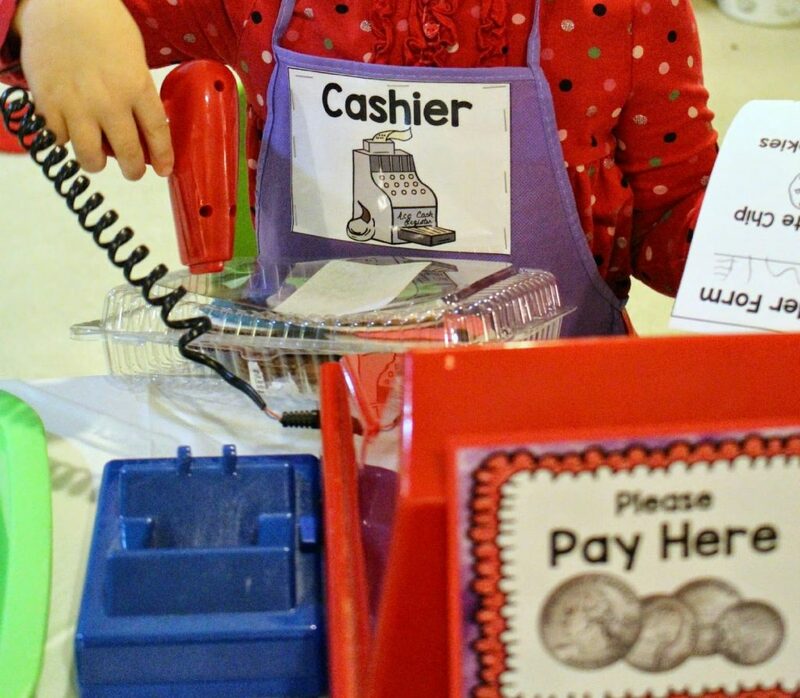 When a customer arrives to buy cookies, he can stop at the front desk and fill out an order form. 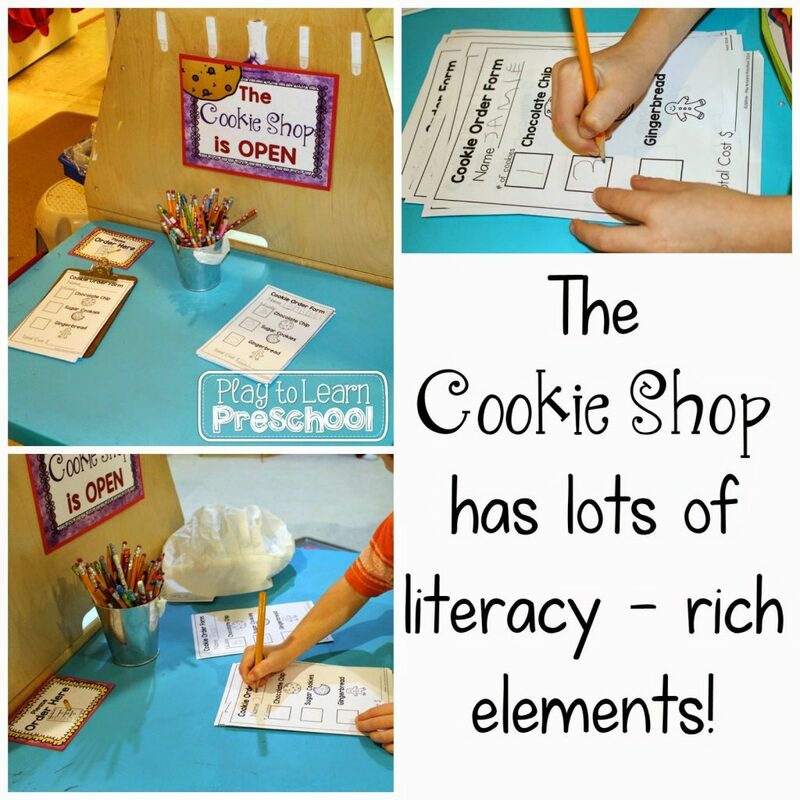 We try to incorporate as many reading and writing activities as we can since they are spending so much time there! So after the customer fills out his order form, he takes it to the counter where the employees place the cookies into a bakery box. We asked our families to save and send in the clear plastic bakery boxes that they get with muffins and cookies. 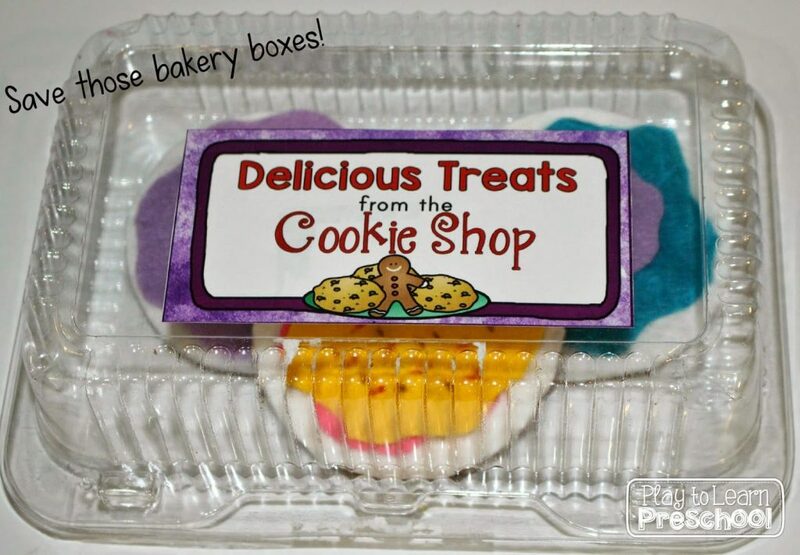 I took the store labels off and added our own unique “Cookie Shop” labels. The cashier totals everything up, and the sale is complete! This center is so.much.fun. Have I already mentioned that?! 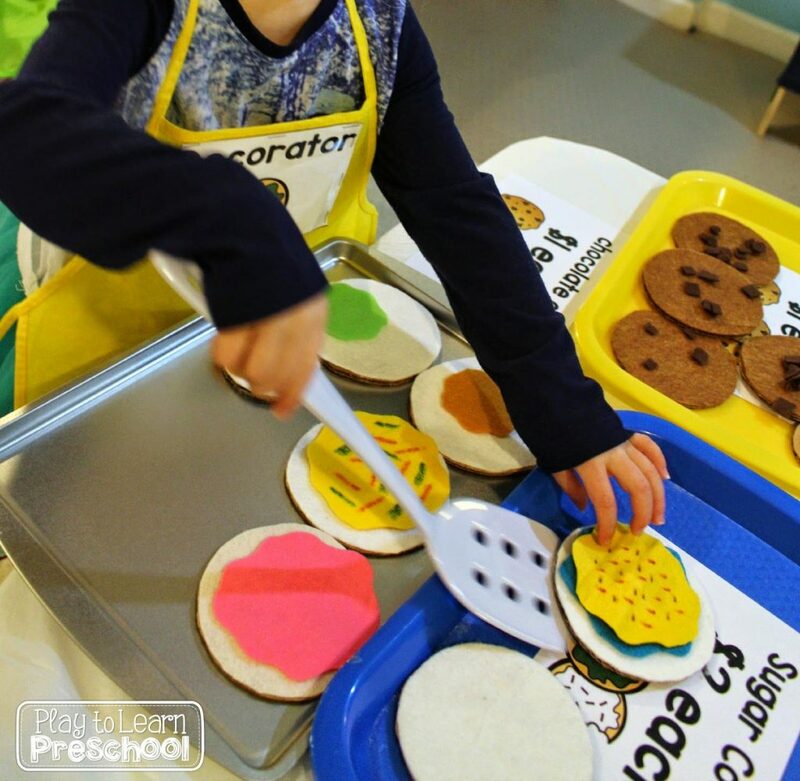 It’s perfect for this time of year because it taps into an activity that many students are currently doing at home with their families — baking cookies. 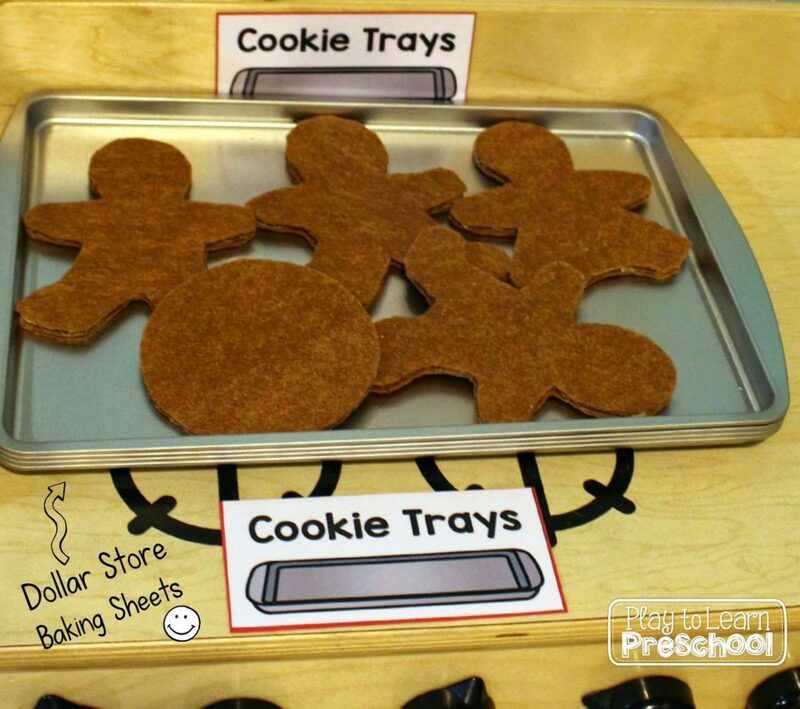 Plus, it goes very well with our Gingerbread Man unit, and of course in a couple of weeks we will have to make cookies for Santa! 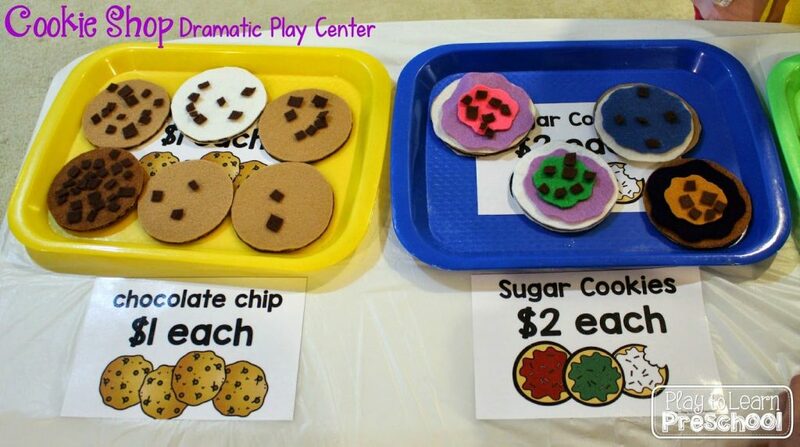 All of the signs, labels, recipes, and order forms are available in this “Cookie Shop” dramatic play set. If you use it in your classroom, we’d love to see some pictures! 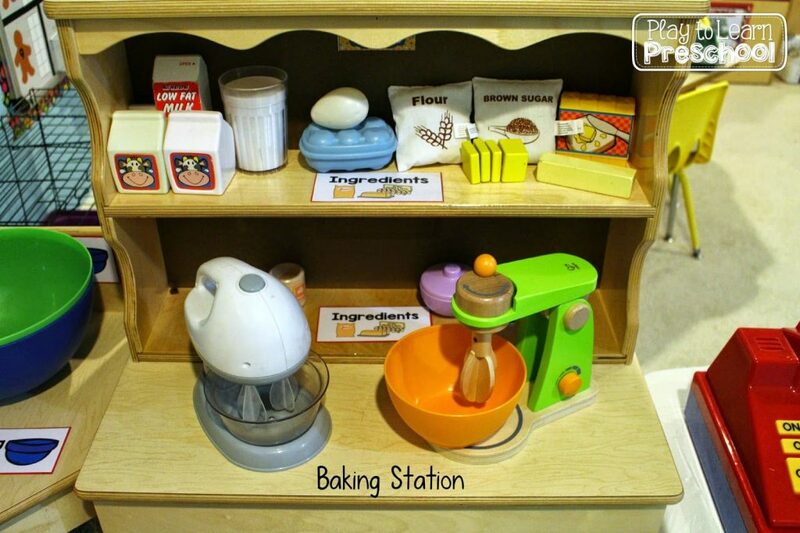 Post them on our Facebook page and let us know how your little bakers liked it. That is such an adorable center! Thank you! We're having a lot of fun with it. You're very welcome! I hope they love it as much as my kiddos do! This looks genius and way fun!! Oh. my. gosh. I want to jump right in and play! 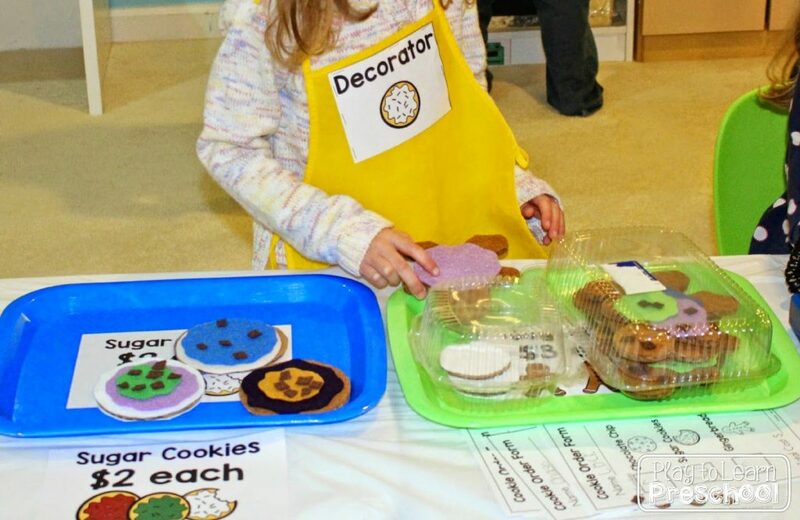 I love all the attention you put into this (job descriptions are, take home containers, cooking props, etc) Fantastic Job! Thank you so much! I enjoy playing at the center with the students, for sure! This is so awesome, I would still love to join in! And there are so many learning elements, that makes it even more perfect.